Over the period 1820 to 1925 hundreds of ships made successful voyages to New Zealand bringing thousands of immigrants, livestock and cargo to the 'new' land. Despite the hazards that existed at the time only a very small proportion of ships that sailed from foreign ports failed ... read full description below. Over the period 1820 to 1925 hundreds of ships made successful voyages to New Zealand bringing thousands of immigrants, livestock and cargo to the 'new' land. Despite the hazards that existed at the time only a very small proportion of ships that sailed from foreign ports failed to arrive. The Wellington Evening Post in its edition of 16 October 1880 revealed a darker side to shipping, ship's missing on their voyage out to New Zealand. When bodies or wreckage had been located on a distant shore the story would gain momentum. If there were no reports of wreckage, survivors or sightings of a missing ship this often meant only a few lines in the daily newspaper. The phrase 'never seen or heard of again' would be the editor's epitaph. This publication records the details of 112 ships lost or wrecked on their voyage to New Zealand during the period 1820 to 1925. How many passengers died? How many mariners perished? Answers to these questions and more are revealed for the first time. Ships went missing or were wrecked in the English Channel, Tasman Sea and various locations across the globe. To aid genealogists, names of passengers and crew have been added. After all, shipping losses are more about people than ships. 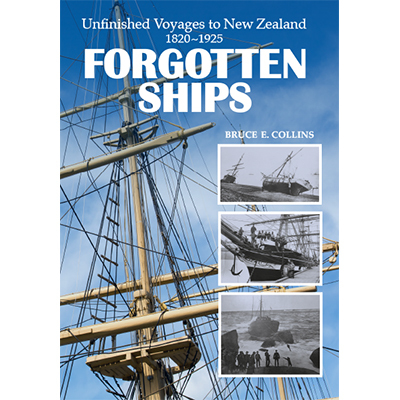 For the last 10 years or so Bruce Collins' has meticulously researched the history of these voyages resulting in a useful and worthy volume to add to the bookshelves of readers interested in the maritime history. 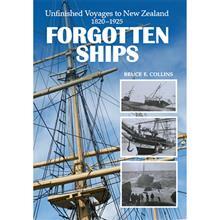 This book is endorsed by the Otago (NZ) Maritime Society.